Soon, the National Library of Ireland will re-scan, re-organize, and fully contextualize its online collection of James Joyce manuscripts. But the die-hard Joyce enthusiasts among us probably found this out in April, when what the NLI calls "The Joyce Papers, c. 1903-1928" first became available. They would have had to do some clicking to get there, though, since the collection debuted and remains buried several layers deep in the site, enjoying what the restaurant industry calls a "soft opening," before its more user-friendly "grand opening" in the near future. 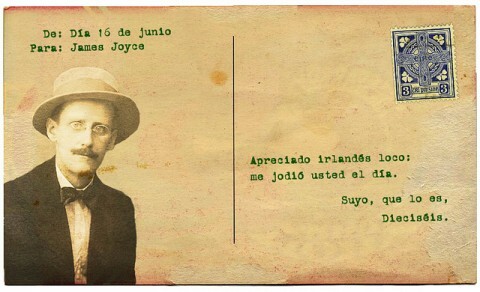 But when you've got the chance to read millions of euros' worth of writing in Joyce's own hand — drafts of Ulysses, proofs of Finnegans Wake, notes dating back to his university days — why dawdle? The collection awaits a detailed guide, offering at the moment only a list of manuscripts labeled 36,639/1 through 36,639/19. But you can get a sense of what's in there from assistant keeper Peter Kenny's summary at the top of the page. Terence Killeen in the Irish Times draws special attention to document 36,639/2/A, a journal or "commonplace book, which Joyce used for an unusual variety of purposes: as an account book, as a repository of various passages and poems from his reading that struck him (Ben Jonson is a particular favourite); reading lists; thoughts and reflections on aesthetics; remarks on friends (JF Byrne, for instance); and, eventually, notes for Dubliners and for the figure of Stephen Dedalus as he emerged in the later fiction (some of the notes even look forward to Ulysses)." As if that weren't enough, he also recommends the next document down, a "subject notebook" for Ulysses including "notes on the Irish," "the Clerkenwell bombing of 1867, "the Celtic view of hell by a German professor," and "the Jews and theosophy." And if actually deciphering Joyce's own hand proves too daunting a task, well, you can always wait for the transcriptions. Has anyone managed to figure out how to see these? Really need to get into them for my essay! Or are there any similar collections online? Thanks!